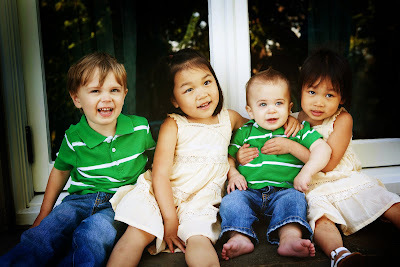 The featured blogger this week is Natalie of The Koprowski Kids. Natalie is the proud MoM of 4 year old twins Chloe and Taylor, 3 year old Coby and 17 month old Tanner. Natalie was even once featured on TLC’s A Baby Story! You have a unique situation with Irish triplets, were you surprised to find out you were pregnant after adopting your twins? We actually knew that we were pregnant before we adopted our twins. 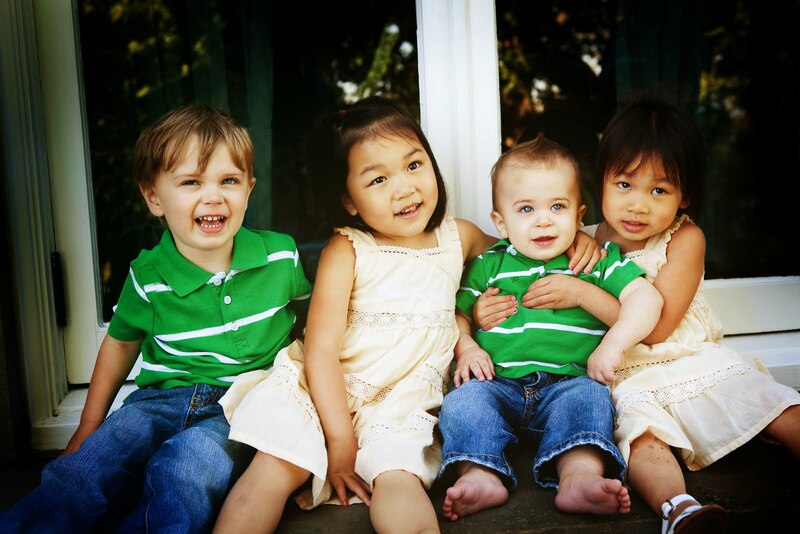 Jake and I wanted a big family and we wanted to have a mix of both adopted and biological children. We were pregnant when we started the adoption process and were told it could take up to 2 years to bring a baby home through adoption. We figured our bio baby and adopted baby would be a year apart in age. The surprise came when we were asked if we wanted to be the parents of two beautiful twin girls just 6 weeks after we started the adoption process. I think we may hold the record for the fastest international adoption to ever take place. We had our girls home from Vietnam less than 4 months from when we decided to adopt. We went from having no children to three children in just 5 short months. What are some of your biggest joys in parenthood? Challenges? One of things I enjoy most about being a mom is watching my children interact with each other. I love the bond my twins have with each other and I love watching them with their younger brothers. It’s nice to have built in playmates and the three older ones will play together for hours on end. Most of our challenges come with trying to meet the needs of so many small children at once. Having 4 kids under age 5 is hectic. I struggle at times just to meet their basic needs. They are all at a very needy stage right now and it’s difficult to give them each individual attention. We started blogging when we left for Vietnam to pick up our daughters. It was a inexpensive and easy way to keep our parents and friends updated each day during our time in Vietnam. We were there for almost a month and would post photos and tidbits about each day. Once we returned home things got really chaotic. The girls were both hospitalized and then the baby was born. I took a break from blogging and when Coby was 3 months old we started up again. I’ve been blogging for 4 years now. I think its a great way amongst all the chaos to share photos and fun things about the kids. What are some of your favorite activities to do as a family? Our absolute favorite thing to do is nap. I can’t think of anything better than family naptime. Unfortunately 3 of our kids no longer nap. We have recently started ice skating. My husband plays hockey and he is really enjoying teaching our kids to skate. We also love to be outside, riding bikes, go to parks and play in the water. What question(s) do you have for the other families in the community? I guess that my question is: what do you moms of multiples out there do when it comes to self-care? How do you find the time to make yourself look put-together and presentable, let alone exercise? Be sure to leave your answer to Natalie’s questions in the comment section and then head over to the Koprowski Kids to leave some bloggy love! Nice to meet you. I have two sons adopted from Vietnam. 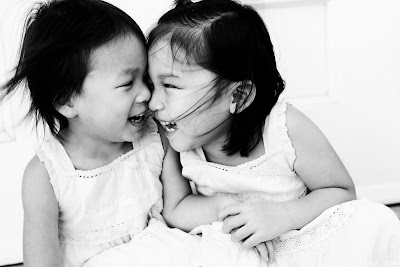 And we'll be going the virtual triplet route soon, when we bring home our daughter from China. You have a beautiful family. I am so guilty of not taking time to myself to exercise. But I figure repeatedly removing twins from the table and cleaning up after and teaching the others as well counts for some kind of exercise! On rare occasions I look put-together. Mostly I try to just be presentable. My husband is very supportive of me taking time out for me– but I have a hard time doing it. It makes me feel guilty when I know I have so much to do. But even a few minutes to myself a day makes a difference. Loved this post! I watched Baby story on a Friday and on that Sunday at church saw these adorable twin girls and cute brother and thought that has to be the same lady! It was! It's been so great to get to know this family! I am no help with your question. I can put on the usual that looks decent but as far as taking care of me?… My friend with triplets says that with this many kids something has to give. And that something has been me. But I realize that if I want to be happy, I need to take care of me and that is worth ALOT!